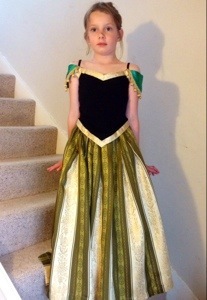 It’s been a while, but am returning to posting with this costume made for my now 7 year old (how has that happened?). Her best friend is having a Frozen themed party next week and it seems this current Disney Frozen kiddy craze means there are no costumes to buy anywhere! And as the best friends have been Anna and Elsa every playtime since Christmas I felt I should get the sewing machine out! I am in the middle of a house overhaul and in a recent cull of my collection of vintage fabrics found this 60s Regency Stripe fabric in dark olive green and cream, perfect for Anna’s skirt as worn to her sister Elsa’s coronation in the film. Before I found this I did have a plan to use a solid green dress lining I have and sew a contrast colour satin ribbon in stripes which I still think would work pretty well. To make the skirt I sewed box pleats in 6″ lengths at the waist of the skirt, hiding the cream stripes inside, my fabric was only about 36″ wide so I used double width and sewed two seams to join the front to the back. 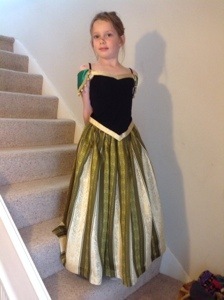 I sewed a generous hem in the top and elasticated the waist gathering the pleated fabric to the size of Martha’s waist. Then cut and hemmed the bottom. The corset top of Anna’s dress is a black spaghetti strap ladies vest from H&M in XS (£3.99). I had to shorten the straps by about 6″ unpicking them from the back cutting them shorter and reattaching. I then cut the hem of the vest into a point at the front and straight at the back a little lower than Martha’s waist so it would hide the waistband of the skirt. Then I edged the top and bottom with gold ribbon, I didn’t bother to hem the vest. For the little capped sleeves I cut two squashed semi circles out of doubled over emerald green satin fabric. (The fold is the straight edge) and sewed them together right sides in leaving a gap in the middle of the curved edge to pull them right sides out. Then I attached the gold braid with bobbles on around the curved edge with a zigzag stitch also sealing up the gap. These were attached by hand sewing the end points to the vest top where the straps are joined to the body of the vest. I know Anna’s sleeves in the film are edged with green lace, but I didn’t have any, however I found the gold bobble trim in another box of collected vintage sewing stuff and they reminded me of the bobble trim on Anna’s travelling cloak! (Yes I have done my homework!) I also had a plan to embellish the front of the corset with blue and pink fabric paint, but Martha is happy with it as it is and I am slightly afraid of spoiling what I think is a pretty decent job! If necessity means that any readers out there are driven to trying out this make for their own Frozen costume, I would recommend looking for a similar curtain/upholstery fabric on eBay or Etsy, useful search terms would be regency/brocade/jacquard stripe. Or try the ribbon stripe effect. Please let me know how your projects turn out?